I wrote a post on Drupal galleries for images and photos about a year ago and it remains one of my most frequently read posts. At the time I just wanted something simple to manage sets of pictures of Dior my son. So what’s happened in a year? It seems like a lot has changed. 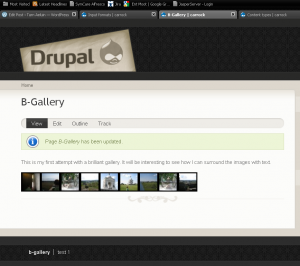 Revisiting galleries with Drupal 6.15 is required! Gone are some of the modules that I reviewed before and new modules that really look cool are out on drupal.org. I’ll take a look at a couple of the tools and work to get them installed on AmonSul (my Mac-based Drupal config). There are a bunch of other ones on the site so why these? Well I looked at the history of new versions to see which ones are getting updated consistently, I looked at modules where the author committed to a version 7, and I looked for the features I like: lightbox, multi-upload, auto-scaling, and if possible an integration with Picasa. Let’s level-set before getting going. 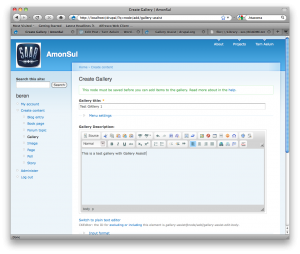 Prior to starting work with gallery tools you need to make sure you have Drupal ready for this. You need to enable file uploads in the admin tool. You’ll also need to bump up the threshold for maximum upload size and for the total MB of uploads for a user. These options are all in Site Configuration, File Uploads. Also – make sure to allow users to use the modules on the Permissions page. I also updated my php.ini file so that I can upload massive images and crap. Be careful how you do this on a production server or you’ll get hacked and killed. This module is new since my review and it really looks nice. 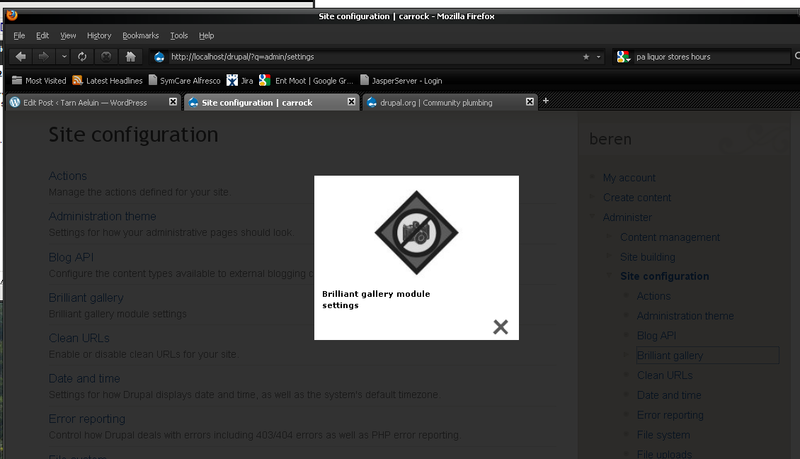 I grabbed the Gallery Assist, the Gallery Assist Lig htboxes, ColorPcker, and Gallery Assist Support module. I also grabbed the PrettyPhoto lightbox library. I copied all the modules over to the modules directory and then followed the install instructions in the Pretty Photo script library – all you do is copy the prettyPhoto folder into the lightboxes folder inside galleryassist_lightboxes folder. Once these things are all installed you can create galleries right away. The setup is pretty obvious to perform. 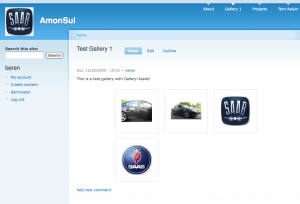 Create a gallery and then you can add images to the gallery using a simple form. The gallery will display images in a very basic way – as far as I can tell there is no slide show mode and no light-boxing out of the box. Images are paginated and they do scale as you stretch your browser. You can control the page view using the layout parameters. This is really a cool feature. 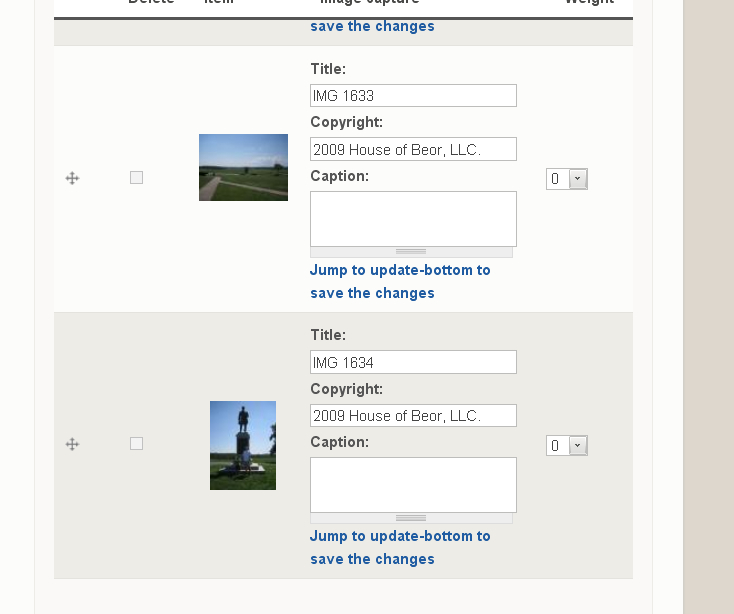 Each content type that has Gallery Assist added to it can have its own layout. So what you can do is create new types and then have different gallery layouts depending on what kind of gallery it is. That’s something I’ve not seen in other tools. Very nice indeed! Here’s how my gallery looks after I added a few more pics and then messed around with the layout. It would be better if I took the time to make my images all the same size I guess. Later you can go back and add more details later to your images – check the thumbnail to see that. As I said I downloaded the prettyPhoto lightbox so the next step is to get that configured correctly. Ah crap – the instruction videos for this product are wmv format and I’m on a Mac. Darn. Ok – hang on…2 days later…back in action…I had to back off Drupal 7 and get 6 working on my PC…there’s a good video link from the Gallery Assist Lightbboxes module project page. It is pretty simple, install the module, enable it, copy the lightbox you want to use over (prettyPhoto in my case) into a folder of the same name in the lightboxes subfolder of the module (pretty Photo), go the Gallery Assist configuration page, click the Extras tab, pick the lightbox you copied over and bingo! Pretty slick and the ability to use the lightbox that you like is really nice. This set of modules will be very difficult to beat. 4.5/5 stars from me! Fantastic! This set of modules provides a complete solution for uploading sets of files and configuring them into galleries. Get ready for some serious installation work to get this one working. You need to install CCK plus a whole bunch of supporting modules and JS libraries. Phew – the instructions are pretty good at least. The best thing to do with this module is to really read the instructions carefully. Image FUpload, Content, FileField, ImageField, Imagecache. What I did was start with installing those modules and keep checking them off on the modules screen to install them. Check each one off – if you can’t check the box see what’s disabled, missing, or messed up in the dependency list. Then go grab the module and fix it. I was able to keep doing this and got evertyhing installed. The getid3 module is a pain – read the instructions carefully.When you think you have everything ok – go to the Administer–>Reports–>Status Report and run it. If modules are installed but not configured right this screen can help. After all that I see all the screens, I can upload images, but then when it comes to putting them in a gallery – boom. I get a page not found error. I see the files uploaded on the server, processed, and thumbnailed. Not sure what exactly is wrong. Perhaps a mod_security issue? I’m not sure. Ugh – DOA. No clue how to proceed. Maybe this is somehting with my Mac, I’m not sure, but already I can tell this is just not happening for me. Way too many things to install and really just not enough help getting it all working. I’m going to give up for now and try some more later on – may be I will repeat this on my PC where I won’t have to also deal with the whole Mac thing. This tool really looks cool, but can it beat Gallery Assist? Here we go…instlal the module and the LightBox2 module that it depends on. After I restarted I had a strange problem caused by Lightbox2. Any link in my site that I clicked on brought up the lightbox, see the attached pic. I found this issue on the module pages. In that ticket there’s a patch file, but also the statement that the fix has been implemented in the dev version. I installed that version, cleared my cached data, and bounced my Drupal server – problem fixed. With that solved I installed the main module, checked out the large number of parameters. I see one that looks interesting – there’s a “crop preview images to the same shape” option that will solve my minor problem with Gallery Assist. I checked that one on. I had a slight problem when clicking on the Permissions link from the module configuration page – for some reason I get routed to my apache root index.html page, not sure what problems will arise from that. That resulted in the following gallery showing up. Clicking on any image opens the lightbox. Ok – that is pretty cool, yes for sure. I really like also that I can put other text on the page. BG gallery supports a few lightboxes so you can switch around for different looks too. I like thickbox the best I guess. and magically the album should show up…but for me it is not working. Intuitively I cannot see how this can work for private albums since you are not authenticating from the drupal site. My guess that for private albums this does not work. Maybe I’m old fashioned, but I don’t like putting pics of my kids out for creepy people to look at so I guess this feature won’t work for me in general. That’s too bad. Well even without the killer feature – BG is a really nice tool and has a lot of advantages. Wow – how things have changed in a year! Well obviously I like 2/3 of these tools. The CCK stuff is just too much hassle for me to deal with. Between Gallery Assist and Brilliant Gallery it is a difficult call. If BG worked with Picasa the way I wanted it to then I would say that BG is hands down the best. 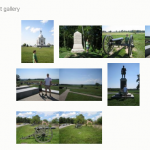 Without Picasa support I think GalleryAssist is the easier tool to use to quickly upload images into galleries – especially if you do not have or want to routinely copy images to your server’s filesystem. 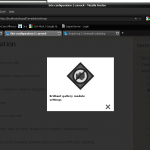 GalleryAssist also has more options for lightboxes. BG is more of a power tool I think – great for when you really want to make a gallery integrated into a page that looks super cool. It appears that the tools cannot both be used in the same site. When Gallery Assist is installed BG will no longer work. I hope I can fix that. I’ll keep plugging away with BG and Picasa – if I figure it out I will update the post. I’ve done some more plugging away with BG – it seems that it will only work with public or unlisted galleries. I’ve also looked into the lightbox options – and I think it is fair to say that really only LightBox 2 is an option since ThickBox is no longer being developed and Gregybox is just kind of lame. On the positive I’ve found that BG can handle large pics and still perform well and I added in the color picker and some other optional stuff and everything seems to work ok.
I’ve also now installed the upcoming release and the new script tags to put the gallery in a page make things much easier. Despite the lightbox limitations, I see myself using Brilliant Gallery most of the time. Nice post, I’m trying to learn drupal, and after using wordpress.com for a year, I feel like they are miles apart (which they are). This gallery post will help in designing galleries in the future, thanks. A pity you didn’t get the second method working, because its the most flexible one if you want to have total control over the display of your images with views. The fupload module is quite new and I suppose you have this issue: http://drupal.org/node/399644#comment-2294896 which can by simply solved (at the moment) by visiting the settings page and save. It’s true that for a nice image gallery with the cck method you need to activate quite a bit of modules, allthough most Drupal sites are allready using cck and views for other listings so those are normally allready present on your installation. There is also a new option to “package” a group of settings with the feature module. As an example you could look at http://www.lullabot.com/articles/photo-galleries-views-attach which gives a nice worked out gallery that needs quite a bit of modules and settings, but that you can activate in one click as a feature. Thanks for your thoughtful comment. In fairness I should go back and repeat the test on my regular PC and see if I can get it working. I do normally also use CCK and Views. Panels and Views are really powerful tools that all Drupal users should know about. I’ll take a look at those links too. I do have to say that BG is pretty nice. I have not been able to get the slideshow features to work and there are some other glitches, but it is a pretty good tool. What I really like in my current Drupal install is that Im using CKeditor – it is really great! Huge improvement over FCK. At this moment i’m using GA at the moment, but there are some minor points i dislike. Although, I’m building the website and someone else is gonna fill it up, GA is in my eyes unbeatable. Why? It’s so easy to use. Great little tutorial. I’ve been struggling with finding a good solution for galleries (I’ve been trying to get the Views Gallery module working with Lightbox2 with no success). 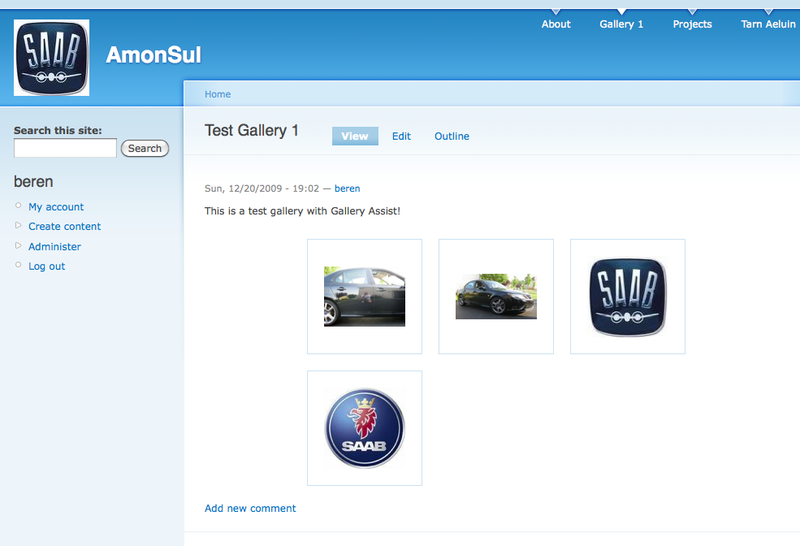 I’m going to try getting Gallery Assist working now that everyone else has said it’s SO easy for end users as well. I think that would be the big determining factor versus Brilliant Gallery… it’s so powerful which means it’s got more things to explain! Unfortunately my users are extremely tech adverse so the less techy the better. Thanks! I use VLC on my PC laptop, but not on my Mac. To be honest I really only use my Mac when I really need it. Its just too much of a pain to find software for it. It could be really nice and simply done. With module CCK and Image Field: create new content type gallery, create there new field image, set in to unlimited (so u can dynamically set as many photos as u need). Add module filefieldpaths to define in which directory images would be uploaded (instead of just putting all of them in files directory). 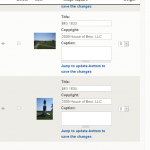 Add lightbox and imagecache to define the view of thumbnails and display. Now u can configure how u want it to look with the views module. Now u can think its a bit of work and download, wrong! CCK and Views and must get for drupal, sooner or later u will need to learn them. Siar – thanks for the feedback. I think your method is different – not that mine was wrong. I was trying to use CCK and Fupload. I still think the CCK method will be more work and less successful in general than Brilliant Gallery. You’re definitely right that many Drupal modules rely on CCK as a base so becoming familiar with CCK is handy…same is true of Views and even Panels. I dont recommend using fupload, its kinda buggy and doesnt have the drupal look & feel, and most important – its not needed until u have really big galleries, but then this whole method is inappropriate. About CCK and Views – without them u cannot really do anything in Drupal, althought instead of panels (stil dont know it) im using simpler: composite layouts. 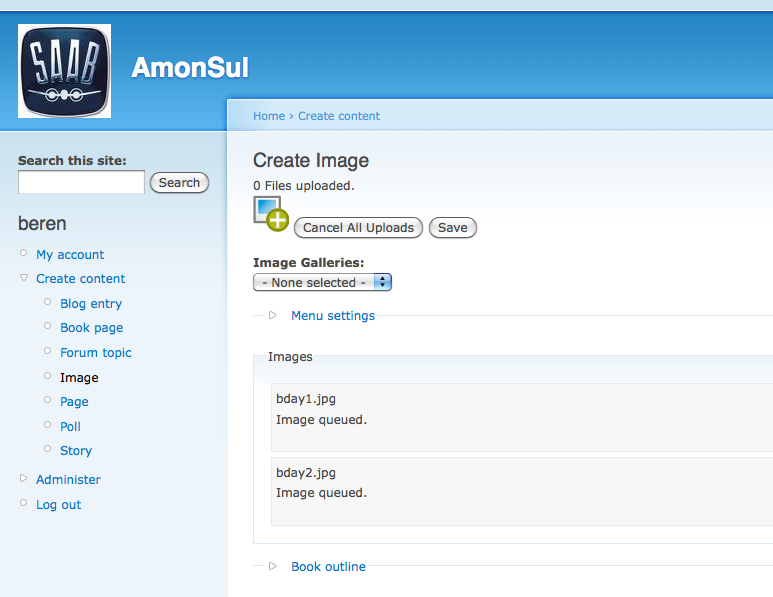 Recently, I created mine first galleries in Drupal, so i can send u some screenshots how it works when its ready, if u want? Hello, I tried to use brilliant gallery. I am sorry , i am new to drupal and to ask this dumb question. I tried to copy the code in a block, it just displayed the code and no image displayed. Please let me know, where i should insert this code . I am so grateful for your post here! 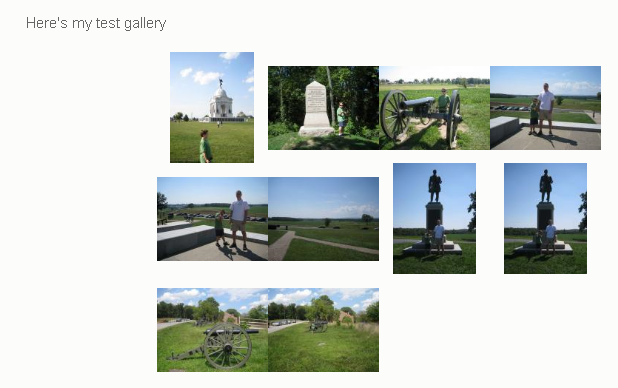 I had been fighting with 5 or 6 photo gallery modules (I’m very new to Drupal), trying to make something easy for my client to edit their own galleries… and the Gallery Assist/prettyphoto combo you mentioned works GREAT! You’re welcome – glad it was helpful. happy Drupal-ing!